Home is where the heart is, they say. No wonder we pay close attention to the details of our homes because that’s where our hearts are. Home is not just a place where your family sleeps; it’s where you make memories together and with friends that you will cherish forever. Your home decor and furnishings are the stage for all this, and it all starts as soon as you walk in your front door. Make that entryway look inviting for your guests. If you have an old glass table, make it look new by using white linen to cover up the base. On top of the table, you can have a choice of your flower in a clear vase. You can restrain the colors or go vibrant to contrast the subtlety of the white linen base. You can add family pictures or quotes in frames that are welcoming to your visitors. Finally, small pieces of scented candles might complement the elegance of the arrangement. Wooden tables are always known for their versatility. Use this to your advantage. A well-furnished wooden table will not fail to make your guests feel welcome. It’s not too intimidating to look at; hence, it feels like home. Gather old books that are inspirational and let them stand on the table. You can also add succulents to improve the look on the table. “Welcome to our HOME!” would be enough to make someone smile when he enters your humble home. Plus the little cheer of colors brought by the flowers will surely warm your visitor’s heart. You don’t need a new table to give someone a cheer. 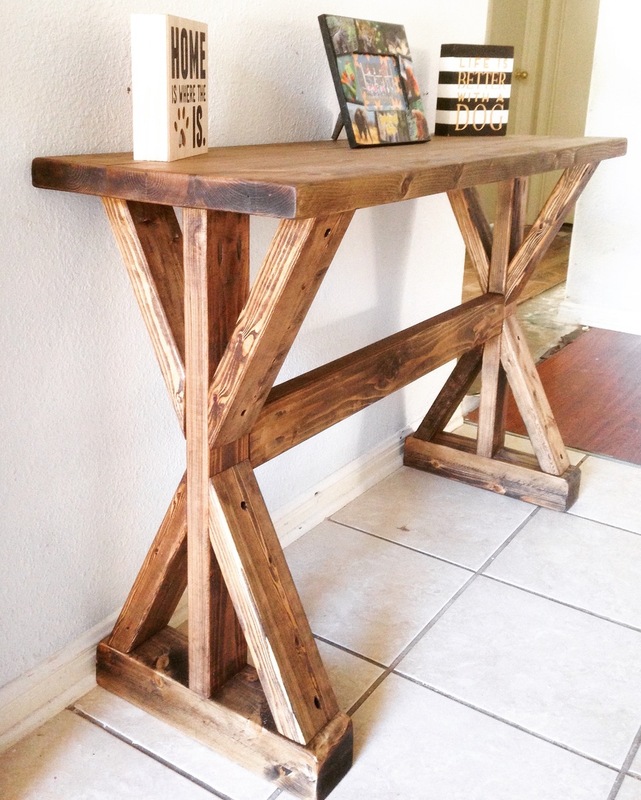 You can repaint an old table to produce a beautiful distressed entry table. Put everything in place including a pair of hand-me-down boots on the side of the table, and it will look just this great. You want to make a unique point, start with your entry table. This will interest your guests that your home is a home of modern art. You can make your own abstract design. But you have to be patient. Beautiful things take time. Are you a traveler? Do you have figurines from the places you’ve been to? It’s time to put them on display! Bring out your porcelains from China, breakables from Thailand, and the miniature of Eiffel tower from Paris. Arrange them properly on the table. Then, add a colorful painting on the wall that you admire the most. Your guests will admire not only your home but also you as an adventurous person. Looking out to have a fresh feel in the early morning, by having breakfast in an open area, then this DIY outdoor furniture idea is best for you. Low based chairs with a wooden round table give ample space and comfort. Best suited for a small family to have some good get-together time, early in the morning with fresh air and birds chirping all around. Is it Christmas yet? You can redecorate your entry tables with decors speaking about the season. You can play with colors of red, green, blue, and gold to come up with a good display. I’m sure there will be a lot of Christmas decors available in the store. There are tiny Christmas trees that you can put on your table. You can also add a dancing or singing Santa on the table to bring it to the next level. If you have invited friends and family over, Santa will never fail to entertain them as soon as they enter the house. Now, you can plan an all-year revamping for your entry table depending on the season. You can include New Year, Valentine’s Day, or even birthdays. If you are diligent enough in updating your table, you can change it over summer and have a playful theme, or winter and have an all-white, snowy theme just like in the picture. It’s all in your power! To achieve this look, you need to have two identical lamps on both ends of your entry table and a mirror hanging on the wall in between. This might look so simple, but sometimes simplicity is the kind of beauty that people want to see. You can add little elements to complement the look but don’t get too overwhelmed. The stars of the scene are the symmetrical lamps. This is the most relatable and personal style that you can have for your entry table. Use your entry table to speak about yourself prominently. Gather all the great things that you have that you are willing to display. Just make sure that they work altogether in one picture. This might be a painting that you love, an artwork that was given to you by your artist friend, a book that your mother handed to you, or a plant that was given by a special person. It can be a basket you’ve won for the first time in a raffle! These treasured items will be the things that you want to see after a long day at work. It will remind you that life is still wonderful. Make a statement with those bold wallpapers! It’s going to be eye-catching definitely. This might be overwhelming to your guests in a positive way. I’m sure they will be expecting more from you because of this. Keep those standards up! Beach always sounds cool and exciting. How about we imitate the color of the water, waves, skies, and sand? You’d agree if I say that sounds even cooler. Your entry table will be one of the first things that your guests will see when they enter your house. Giving them that cool feeling will make you cool as well. You can go for a simple design and let the colors do the trick for you. If you can spare space, you might as well go for a console table in your entryway. You can store things inside the built-in storage while keeping the elegance of your entryway. You can keep your décor minimal and simple. Go for green plants that will brighten up the space and don’t add too many decorations to the table because you may overpower it. Try an entry table in bright red to give that pop color in your room. This will bring excitement to you and your friends. Just make sure that the table isn’t too big so that it won’t overwhelm you. The color red has always been a head-turner even for lipsticks and dresses. It always gives that “Wow” factor even for things on display. Add a few accents on the table to make a better picture. You can add your favorite antique vases or figurines. Or old books and magazines on top to make it more well-designed.